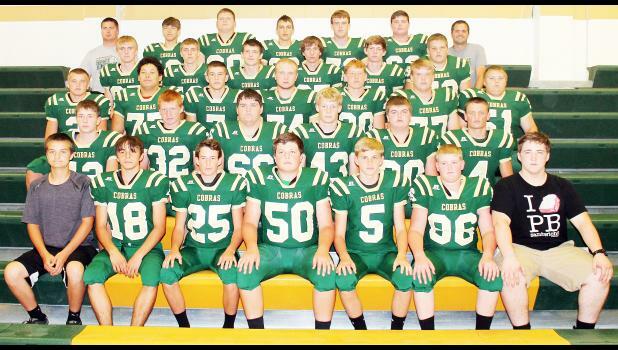 Jackson Heights High School’s 2018 Cobra football team is shown in the photo above. Front row, from left: manager Devon Jones, Wyatt Bacon, Silas Holliday, Kylen Kilpatrick, Reece Williams, Quinton Childs and manager Ed Mandala. Second row, from left: Ian Anderson, Jason White, Colby Doyle, Conlan Bruggeman, Brantley Dohl and Kolby Rethman. Third row, from left: Cooper Williams, Taylor Wamego, Jason Bosley, Curtis Niehues, Dylan Lacey, Dakota Abel and Ryan Schumann. Fourth row, from left: Lane Thomas, Levi Olberding, Grant Amon, Alex Stirton, Cable Wareham and Riley Watkins. Back row, from left: assistant coach Greg Nilges, Dylan Thompson, Hudson Roles, Joel Kennedy, Carson Williams, Trey Manuel and head coach Caleb Wick.